CablesOne offers a full range of utility services for Outside Plant Fiber to the CCTV which involves the infrastructure design and planning, cable design, implementation, supply and install cable path, camera pole, IP67 Cabinet and IP67 active equipment. Outside Plant CCTV, frequently faces problems with centralized electrical power and fiber optic cable management. Hence, CablesOne custom designs the specifications and requirements of composite cable (Hybrid), which combines fiber optic cable and electrical power cables into one cable. To provide a comprehensive solution, CablesOne also custom designs the Hybrid panel. CablesOne has successfully implemented multiple utilities and Fiber to the CCTV projects for the prison service, military and government agencies for a number of years including redundant fiber optic networks for military bases and hospital as well as multiple fiber projects nationwide. Hybrid optical and electrical cables can be used in Outdoor CCTV and wireless outdoor Fiber-to-the-antenna (FTTA) applications. In these cables, the optical fibers carry information, and the electrical conductors are used to transmit power. 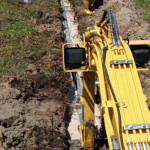 These cables can be placed in several environments to serve antenna mounted on poles, towers or other structures. 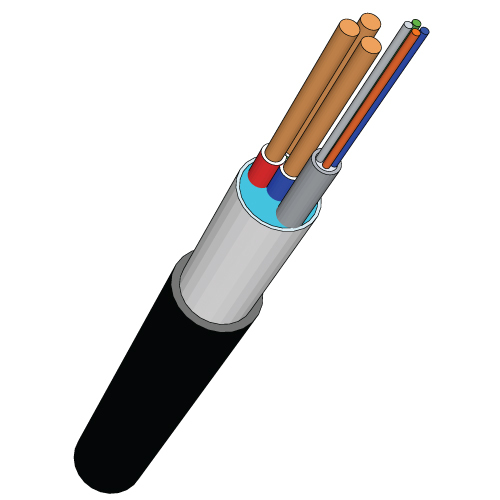 According to Telcordia GR-3173, the Generic Requirements for hybrid optical and electrical cables for use in wireless outdoor Fiber To The Antenna (FTTA) applications, specify that these hybrid cables are intended to carry optical fibers, twisted pair/quad elements, coaxial cables or current carrying electrical conductors under a common outer jacket. The power conductors used in these hybrid cables are for directly powering an antenna or for powering tower-mounted electronics exclusively serving an antenna. They have a nominal voltage normally less than 60 VDC or 108/120 VAC. However, other voltages may be present depending on the application and the relevant National Electrical Code (NEC). 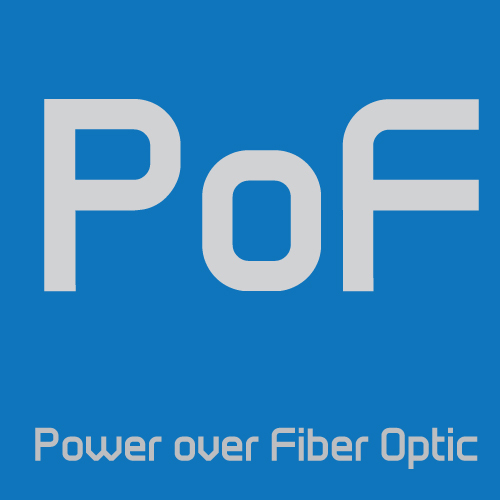 CablesOne has recently introduced the new technology known as Power-over-Fiber (PoF). This is a technology in which a fiber optic cable carries optical power, which is used as an energy source rather than, or as well as, carrying data. This allows a device to be remotely powered, while providing electrical isolation between the device and the power supply. Such systems can be used to protect the power supply from dangerous voltages such as from lightning, or to prevent voltage from the supply from igniting explosives. Power-over-Fiber technology delivers electrical power by sending laser light through lightweight, non-conductive fiber optic cable to a remote photovoltaic receiver. 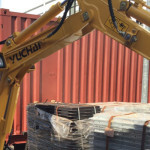 Sending power via PoF has many advantages over using copper wires in a variety of applications, including underwater robots and sensors, high voltage environments (research labs, power substations), strong magnetic field environments (MRI machines, research labs), commercial aircraft and tethered VTOL aircraft. The many advantages of PoF include no EMI emissions, impervious to adverse conditions such as temperature extremes and moisture, immune to crosstalk, EMI, RFI, electric and magnetic fields as well as lightning. PoF technology eliminates the possibility of explosion or leak and the optical fiber solution is lighter than using copper wires. 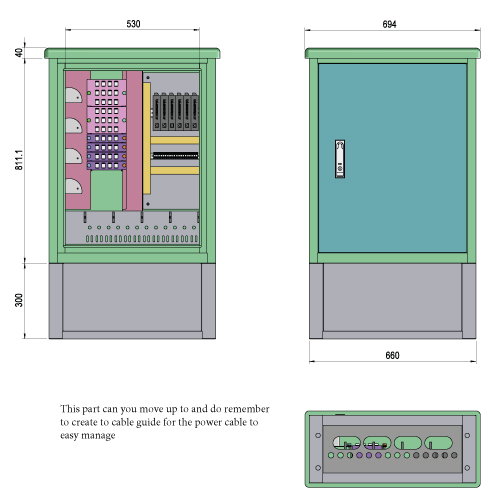 An outdoors optical cross connection cabinet, the IP67, is currently being widely used for cross-connecting outdoor optical cables. This cabinet provides the ideal opportunity for fibers to be spliced and well organized in outdoor environments. The cabinet features a high strength glass-fiber polyester (SMC) body, which ensures excellent performance of mechanical durability, anti-erosion and aging resistance. The cabinet is a lightweight, solid and fully closed structure with the added advantages of being dust-proof, having a pleasing and neat appearance and excellent waterproof performance. 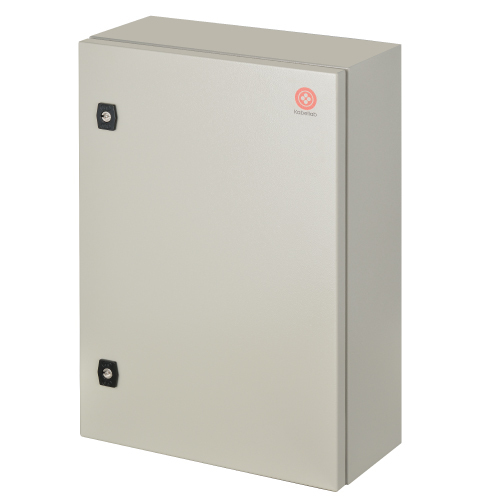 CablesOne Hybrid Panel is designed for use with the IP67 Cabinet in outdoor environments. The panel allows fiber optic termination and power cable termination in a safe manner. Our Hybrid Panel combines the Fiber Optic Splicing tray, adapter, power termination block and C19 IEC socket for incoming power 16A (max). This panel is able distribute up to 10 CCTV fiber lines and the hybrid Fiber Optic Adapter or coupler can accept different types of connectors such as be ST to SC, LC to SC and FC types.